In Windows XP, a WHQL-signed driver installs smoothly without any warning messages. 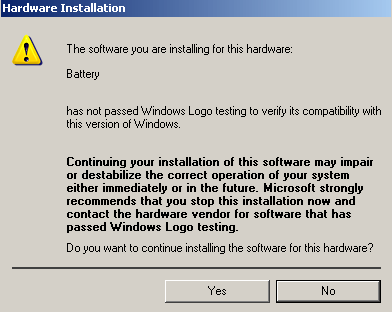 WHQL (Windows Hardware Quality Labs) secure signature (file in .CAT) is given to a device driver after developers successfully completed HCT (Hardware Compatibility Tests), and included into the downloadable driver package. The unsigned non-WHQL compliant driver, meanwhile, will pop up and prompt a warning dialog window. 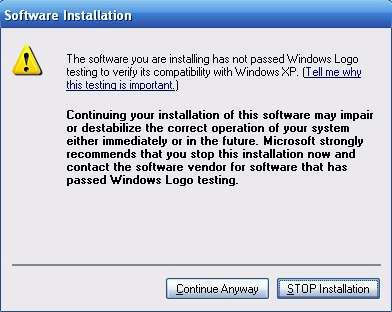 The warning message basically reminds users that the hardware device driver or software that being installed has not passed Windows Logo testing to verify its compatibility with Windows XP, and users can click on Continue Anyway to force install the uncertified drivers, or STOP Installation to terminate the installation process. It’s pretty annoying to see the warning dialog prompted every now and then, and some more it delays the completion of device driver installation, in some cases wasting time when users forget to monitor the progress and leave the installation to run on its way, stopping at unsigned driver dialog indefinitely waiting for user input. Here’s the trick to suppress the unsigned uncertified driver warning and force installation to continue automatically. Right click on My Computer then select Properties to open System Properties. In “System Properties” dialog box, select the Hardware tab. Click on Driver Signing button. In the “Driver Signing Options” dialog box, under “What actions you want Windows to take?” section, three levels of actions on digital signature verification is provided, with default as Warn – Prompt me each time to choose an action. Default will generate the Hardware Installation or Software Installation dialog box as shown earlier whenever an unsigned driver is detected. To suppress and skip the warning dialog and install unsigned driver automatically, select the radio button for Ignore – Install the software anyway and don’t ask for my approval. You can also select Block – Never install unsigned driver software to NOT INSTALL any uncertified driver – no question asked, and no way to change during installation – so it’s not recommended. In “Administrator option” section, tick the check box for Make this action the system default. Click on OK button twice to exit. Above methods works for both Windows XP Professional and Windows XP Home edition. For XP Professional, users can use group policy to enforce the no warning dialog rule too. Click on Start button, then click on Run. In the Run box, type gpedit.msc, then press Enter. Select System folder in the tree. 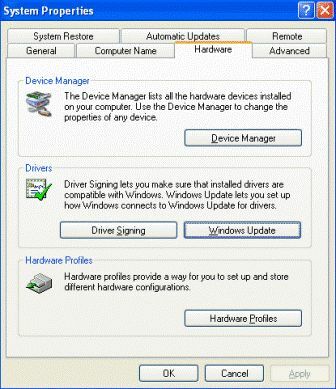 Right click on Code signing for device drivers, and then select Properties. In the “Settings” tab, you should see “Enable” as the default action. Select Ignore from the drop down list to silently allow all unsigned drivers to install. 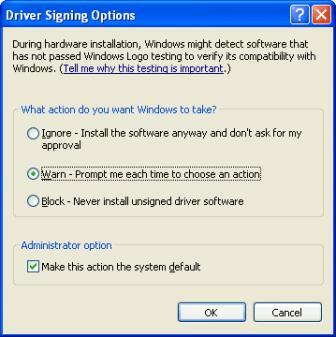 Users can also select Disable to stop all unsigned drivers installation, which cannot be overrode during installation process. Now you don’t have to worry about clicking on Continue Anyway when installing a new device (or old device) to let Windows use the unsigned driver.